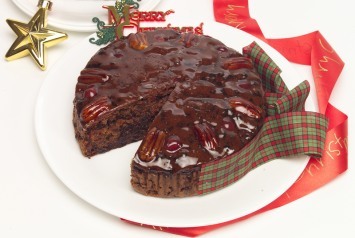 This rich dark fruit cake is one of our two Christmas fruit cake recipes. I think fruit cake gets a bad rap. Many people say they dislike fruit cake, but I personally think they would change their minds if they tried this recipe. With loads of sweet, delicious fruit just held together by moist dark cake, this is one of my favorite desserts. Line a 9" or 10" tube pan with two thicknesses of buttered brown paper. Combine the fruits, nuts and fresh apple in a large bowl. Dredge the fruit with 1/4 cup of the flour. Measure 2 1 cups flour (without sifting) onto a square of waxed paper. Add baking powder, spices and salt. Stir well to blend. Cream together butter and brown sugar until light and fluffy. Add eggs one at a time, beating well after each addition. Beat in molasses and melted chocolate. Add blended dry ingredients to creamed mixture, combining well. Stir in fruit and nut mixture until well mixed. Bake for about 2 1/2 hours, or until a cake tester inserted in the center comes out clean. Let the cake cool completely in the pan on a wire rack. Remove cake from the pan, peel off paper and wrap in foil. Store in an airtight container or in refrigerator for several weeks. Combine 1 cup sugar, 1/2 cup water and 1/3 cup light corn syrup in a sauce pan. Stir over low heat until sugar is dissolved, then boil to firm ball stage (242°F on a candy thermometer). Brush hot glaze over cooled cake. Decorate the top with candied cherries and nuts and brush cake again with hot glaze. Let dry thoroughly before wrapping and storing. Arrange marzipan fruits or dried fruits in a ring around the top of the cake when you are ready to serve it. It makes a pretty centerpiece for the Holiday buffet. For a glaze, like in the image above, brush the cake with apricot jam while it is still warm. This recipe is SO good that during the holiday season I treat myself to a small slice every day. If we make just the best fruit cake recipes – like this one which is moist, delicious and definitely worth making, I think more people will come to love cake studded with delicious dried fruits. If you prefer light fruit cake recipes, you will find ours here. Why Does My Fruitcake Fall in the Middle? Submitted by Marlene M of Ulukhaktok, NT Canada. every now and then my fruitcake falls and I have a dipped center. Can anyone tell me why?? I follow specific directions, watch the heat and water while baking, leave it in it’s pan to cool, I just don’t understand. It starts out looking great then when I look in through the glass a little later it has fallen just as it’s 2/3’s baked. I’d love to get some suggestions as to what’s taking place. Not quite sure why your fruitcake is falling, but often this happens because there is a bit too much liquid in the cake. Try just a bit less liquid. My experience is that fruitcake batter should be difficult to mix it is so thick.